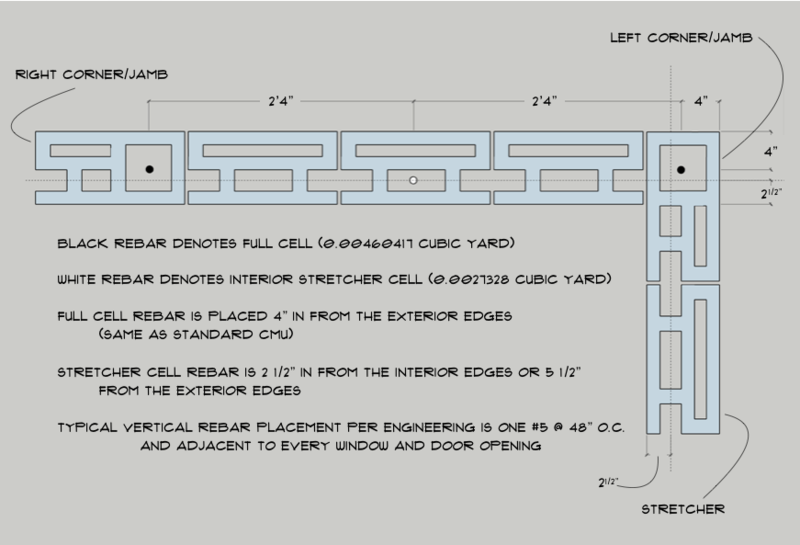 The placement of vertical rebar is critical to any concrete block project. Since Omni Block is an insulated system that provides unsurpassed thermal efficiency the insulation inserts need to be installed in all un-grouted cells. To view a comprehensive detailed sample layout with block and specific rebar placement click on SHOP DRAWING. Structural engineering always “trumps” insulation, but hopefully structural engineers keep the rebar and grout to a minimum without sacrificing structural strength. All Omni Block buildings are individually engineered and the vertical frequency varies depending upon many structural considerations. One #5 rebar every 48″ vertically and the use of standard ladder rod in lieu of horizontal bond beams provides the most ideal situation. It should be noted that at every corner and at every window and door jamb there is an 8″ cell that is fully grouted with the appropriate rebar. Once those are placed then the interior 6″ cells are determined and are fully grouted with rebar. 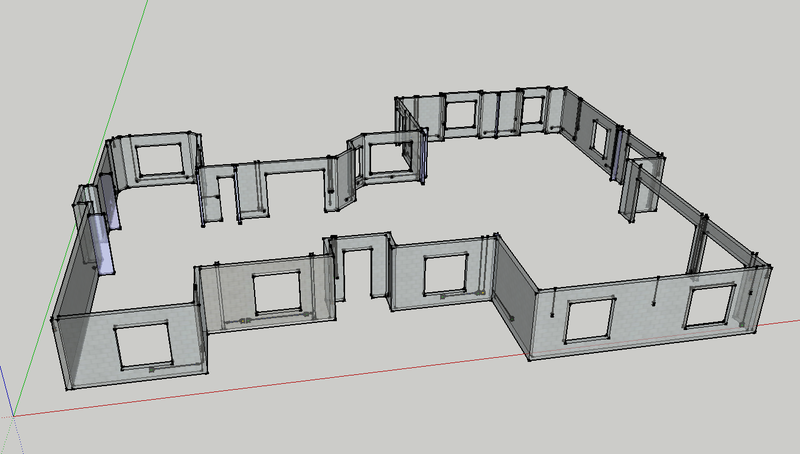 The use of Sketch Up to illustrate block walls help builders and masons visualize block bond, window and door locations, and electrical box and conduit placement. 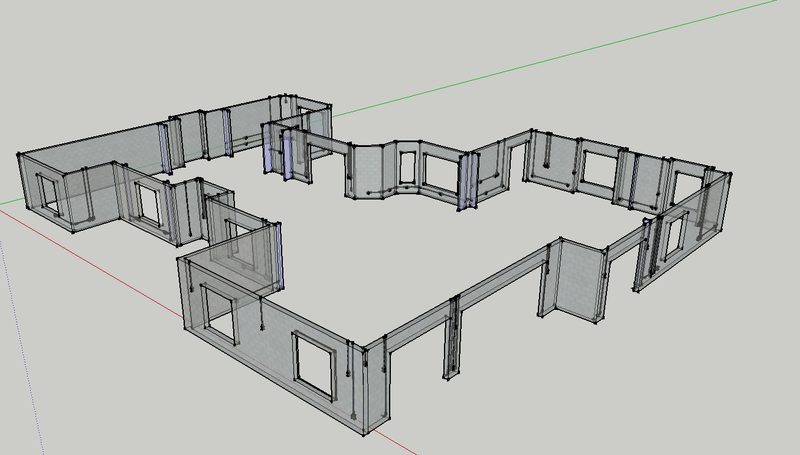 A full library of Omni Block block units and electrical parts are located in the Sketch Up software warehouse. The illustrations above are Sketch Up files of a 4800 sq. ft. residence in Scottsdale. The electrical box and conduit locations are identified in the drawing above. The color-coded boxes (green = interior high voltage, yellow = low voltage, and orange = exterior high voltage) provides the builder, mason, and homeowner a much better idea of where the electrical is to be placed. The illustration depicts a kitchen interior wall. All conduit is 3/4″ PVC. 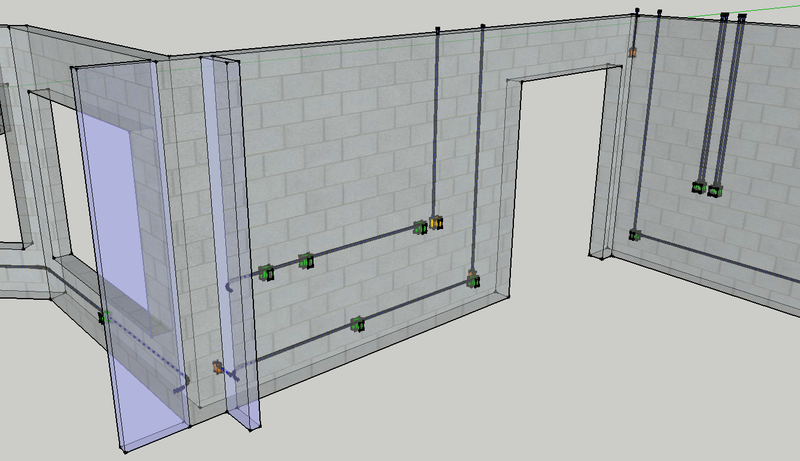 The lavender walls denote interior wood frame partition wall locations where masons use 90° PVC sweeps to get the electrical out of the exterior wall. This allows for the electrician to drop the electrical down the interior hollow wall to be fished into the conduit and the appropriate electrical boxes.